I’m sure some teachers or others wonder why I blog or don’t really understand the point of sharing what’s going on in our school. And I’ve seen recent comments around online about the proliferation of blogs–wondering if we can get overwhelmed or there be too many, etc. But this post at the Principal’s Page blog speaks to one of my primary reasons that I think blogging is important. I blog because it is one way of opening the walls of one school and one library, and sharing the ideas of educators to demonstrate all the complexity that goes on in our practices. Perhaps it’s only one window, but I think as you add all of the windows of education bloggers around the globe, it provides those interested in schools–either policymakers, parents, students, or other educators–a glimpse in through that window. It’s fascinating how schools work and how learning in a classroom works. It’s fascinating to watch a child think through a problem with you in a library until you both find an answer or solution. It’s rejuvenating collaborating with a teacher on something and bringing it to fruition. It’s exciting when students reach out to you with ideas and share their thoughts. I realize that blogs are only one means of opening that window, but it’s important that we think about sharing the positives that go on–and not just the teams winning, or the scores being good, but sharing the day-to-day struggles and learning and growing that happens. If we don’t want the non-school world to have a one-dimensional picture of what we do, then it’s up to us to show and share what an exciting, engaged learning environment looks like. I often think of the model set by former principal Tim Tyson at Mabry Middle School–the masthead of their website, as I’ve mentioned before, proclaims “Making Learning Irresistible for 25 Years.” What a powerful way to begin telling that positive story, even in the design of the campus website. Maybe this is a new tool we need to add to teacher training toolkits–how to share what exciting learning is going on in their classrooms? And to principal toolkits as well? We do have a responsibility to our own campus and classrooms and getting things done there, but I believe we also have a larger mission to serve education well. And part of that must mean telling about the complex and amazing living organisms that are our schools. We will help to inspire support, inspire one another, and help create a community that better understands what we do. I find it fascinating to learn how other schools work. Everyone has their own style of writing and reading. For the most part, blogs do tend to put our best foot forward in our educational experiences and practices. 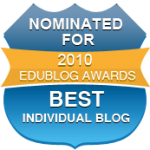 The more voices that are “out there” on the Internet, the more chances other educators have of finding and potentially participating with their own edublog. Bob Sprankle created an interesting Diigo group 2 to 1 Counterbalance in an effort to promote two good educational examples for every bad one in the media. We need more people shouting out the good that is going on in education. I agree that we should be sharing our successes on our blogs – I like the 2:1 “rule” – but I also find value in beating the drum of argument against policies and paradigms in need of change. Lessons learned, too, from new experiments are good to share. Ann, Thanks for pointing me to the 2:1 group on Diigo. Sounds fascinating! I do think of course there are many ways to get our stories, real stories, about schools “out there” and blogging is only one of many, but an important one.